UPDATED: More crowds and sports fans headed up to Holmenkollen in Oslo over the weekend, for World Cup biathlon competition. Organizers promised that they would not be subjected to the drunken disordliness called fylla that plagued last weekend’s World Cup ski jumping and cross-country events, and that they were “working hard” to prevent it from ever happening again. None did, and while there were some reports of rowdiness at a ski-flying event in Vikersund, the biathlon World Cup event at Holmenkollen proceeded peacefully. 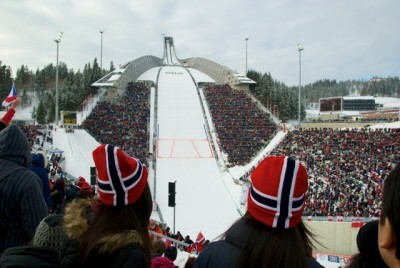 Sæterøy, other local officials and the general public had been stunned and furious by the crowd chaos and embarrassing display of some drunk Norwegians at their worst during, and especially after, Holmenkollen Ski Festival events the weekend before. “Fylla har skylda” (drunkenness is to blame) has long been an expression in Norway used as an excuse when excessive partying results in accidents and other mayhem. It’s largely been blamed for the harrowing conditions that ruined what was supposed to have been a celebration of returning Olympic sports stars and their talent on the ski trails and jumps. Thousands of spectators were left wondering whether they’ll ever go to Holmenkollen again after being subjected to the rowdy and frightening behaviour of drunks, a lack of crowd control and total breakdown of the public transport that was supposed to get them back to town. Officials in charge spent the following week in crisis meetings and responding to demands that such shameful chaos will never erupt again. Sæterøy claimed there had been no major incidents within the arena areas where spectators needed tickets and are subject to inspection of anything they may be carrying. The problems, she believes, were rooted in the crowds that line ski trails out in the “uncontrolled” forest areas known as marka around Holmenkollen. There’s a long tradition of young men, for example, setting up winter camping sites near the race routes, often several days in advance. The campsites have a tendency to become “party central” and venues for excessive drinking. Officials insist they’re trying to come to grips with the drinking culture, and control it. “We had great events,” Sæterøy said, “but they were overshadowed by the hordes who headed for home from marka.” As many as 100,000 people gathered along the race routes in addition to those inside the arena area. Next year, she said, they won’t be funneled through that area towards the few public transport stations when competition is over, and will need to find other means of getting home. That wasn’t a problem during this past weekend’s biathlon competition, all of which took place within controlled areas. Sæterøy said more police and security guards would also be in place. She cited three main areas where improvements can be made in handling crowds at Holmenkollen: Security, logistics and the events program. Many blamed the drunkenness on a relatively late start (2:30pm) for the men’s 50-kilometer race this year, which allowed more time for those partying to drink themselves into oblivion before it even began. Several athletes themselves encourage morning start times, and having both the men’s and women’s races on Saturday, to avoid a concentration of male sports fans who view the men’s 50K as a macho event and act accordingly. Families with children will also have special lines for entry and exit from the arenas, most all vehicular traffic will be prohibited and more people will simply need to be prepared to hike back and forth from Holmenkollen since capacity on the lone metro-line from downtown up to Holmenkollen is limited. Norwegian sports and tourism officials are most concerned that “the good reputation of Holmenkollen” isn’t damaged forever by the drunken conduct of what they insist was a minority akin to football hooligans who spoiled things for the majority. Newspaper Dagsavisen noted that it was common for as many as 150,000 people to attend the annual Holmenkollen ski jumping competition in the 1950s without all the trouble that occurred last weekend. “People walked,” wrote one commentator, “they were more used to that then.” And they didn’t have the money for lots of alcoholic drinks. “It’s time for folks to grow up,” advised another.